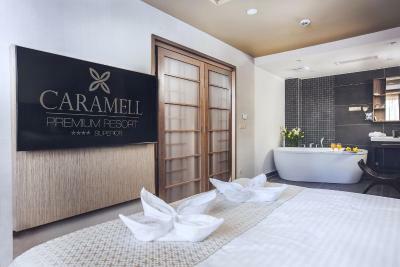 Lock in a great price for Caramell Premium Resort Superior - rated 8.3 by recent guests. Very friendly employees, all speak German well and English quite well. Food was very good and they have quite a wide range to choose from, for breakfast and also for dinner. Bathrobes we got very clean and nice. Room was really amazing (standard Suite) , very nice helpful staff. the room was very nice, bed was comfortable. The breakfast was excellent, very rich and with a big variety. 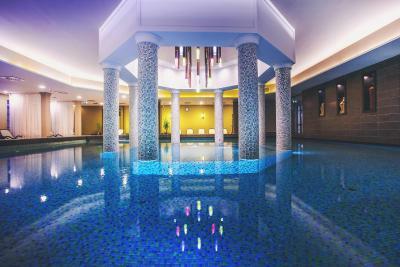 The spa was good with plenty of saunas and pools, including a pool for babies. Every afternoon the hotel offers you a small cake which was lovely. Free parking is a big plus. Nice pool. Spacy rooms. Good for children. Wide variety of food. Good prices of the additional extras not included in price (drinks and so on). The hotel itself is really nice, it was also decorated with nice Christmas things, not to much just perfect. The staff was really nice and the room was also ok. The Saunas in the sauna area were pretty new and nicely planned and not too full with people. Cuisine is great. Welcome drink was nice surprise. 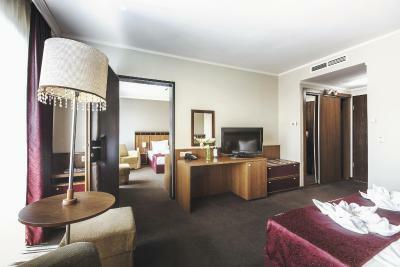 The hotel is fabulous, the rooms are comfortable and well equipped. 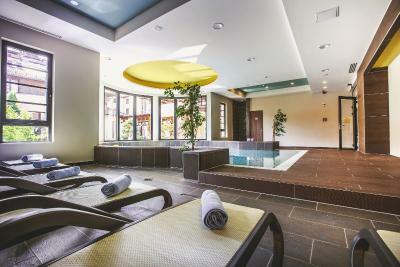 The wellness facilities are amazing and provide numerous relaxation possibilities. The meals are tasty and there is a vast choice both at breakfast and dinner. The staff is very friendly and helpful. We all enjoyed our stay at the maximum. Location and spa. Spa is cozy feels like brabd new! We found our room very comfortable and clear, we also like the view from the balcony.The bed was convenient and the whole place was peaceful and calming, nothing disturbed us. The breakfast and the buffet at dinner was substantial and tasteful. We were lucky because of the shiny, warm weather and we could even swam in the outdoor pool, too. We are sauna-fans and visited the hot finish sauna very often. The stuff was really friendly and helpful. It was our first stay here and we will surely come back again later. 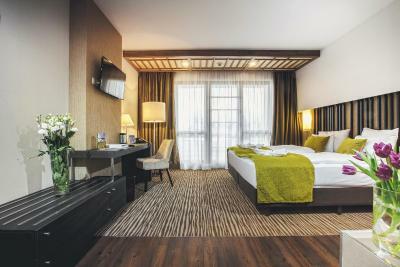 The room was brand new in the new building of the hotel. Bad was very comfortable. I had halfboard, breakfast and dinner were excellent, wide range of choices, Good wellness services, polite staff. 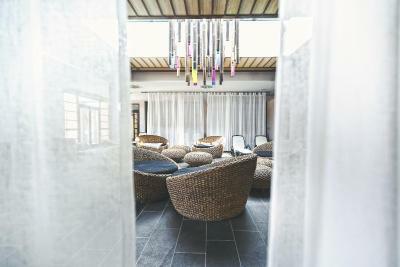 One of our top picks in Bük.Featuring a 2000-square-metre spa area with an indoor pool, a sauna world, a steam bath, a tepidarium and a salt cave, Caramell Premium Resort Superior is a 5-minute walk from the centre of Bük. It offers free WiFi. 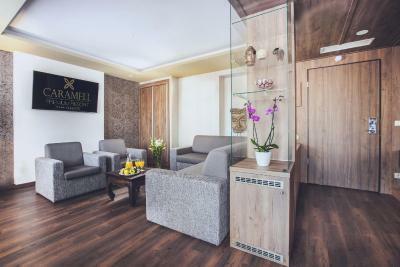 Caramell Premium Resort Superior features a beauty and health centre, and guests can choose from up to 60 different wellness, medical and holistic treatments. In the Mandala Restaurant and the Buddha Bar, guests can enjoy Hungarian and international cuisine, as well as a selection of dietary dishes. 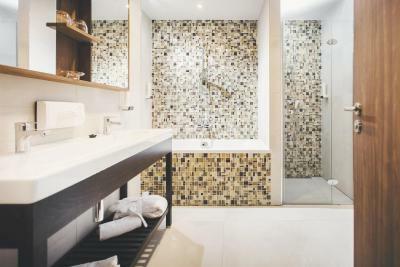 The modern and spacious rooms are air-conditioned and feature a balcony, a minibar, an LCD TV, a safe, and a bathroom. The Crystal Tower, the hotel’s own adventure park, is right next to the main building. Cycling and hiking trails start right outside. The spa area, the fitness room, and the activity programme (including aerobics, stretching, yoga, tai chi, aqua gymnastics) are available free of charge. Bükfürdő is a great choice for travellers interested in clean streets, beaches and Water parks. This is our guests' favourite part of Bük, according to independent reviews. Caramell Premium Resort Superior has been welcoming Booking.com guests since 6 May 2010. 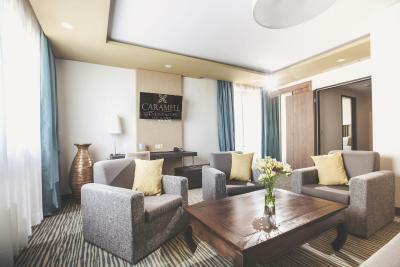 When would you like to stay at Caramell Premium Resort Superior? 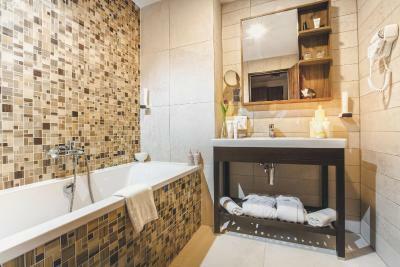 This room features a balcony, a minibar and bathrobes. 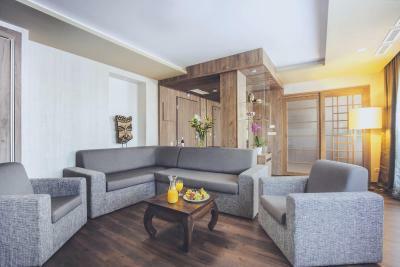 This suite features a balcony, a living room with TV and CD player, an electric kettle, a sofa bed and a separate bedroom. 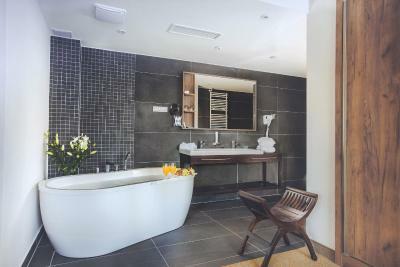 The bathroom is fitted with a hot tub. This twin/double room features a balcony, satellite TV and view. 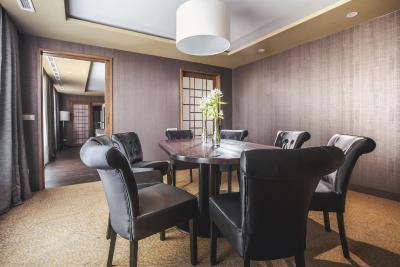 This standard suite features a balcony, seating area and dining area. 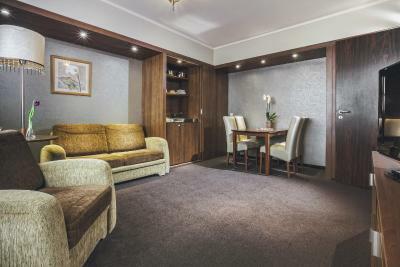 This suite features a balcony, seating area and kitchenette. 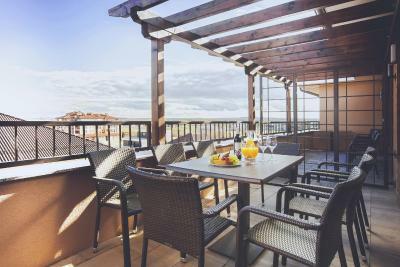 This twin/double room features a balcony, view and satellite TV. 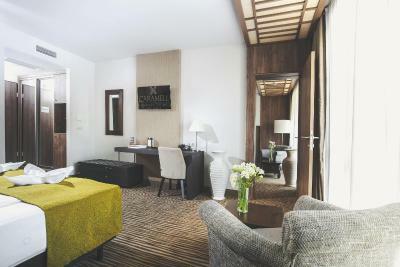 This suite has 2 rooms, a balcony, minibar and seating area. 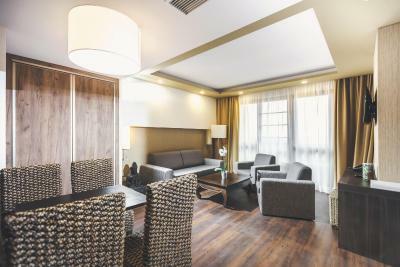 This junior suite has a balcony, minibar and seating area. 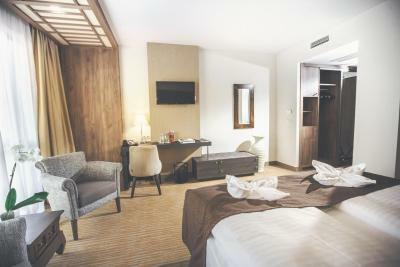 The 2 rooms family-room has a connecting door, a balcony, bathrobe and soundproofing. 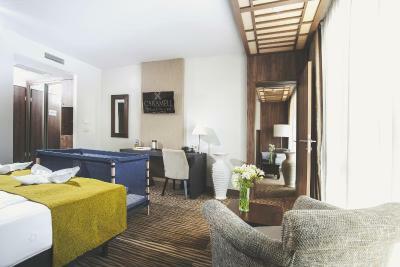 The 2 rooms family-room has a connecting door, a balcony, view and minibar. House rules Caramell Premium Resort Superior takes special requests - add in the next step! Caramell Premium Resort Superior accepts these cards and reserves the right to temporarily hold an amount prior to arrival. 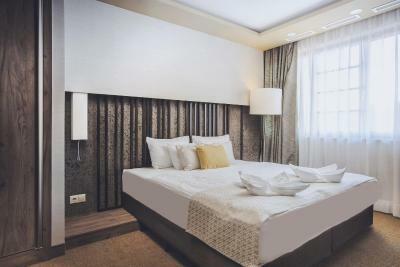 The property accepts Szép card as a payment method. 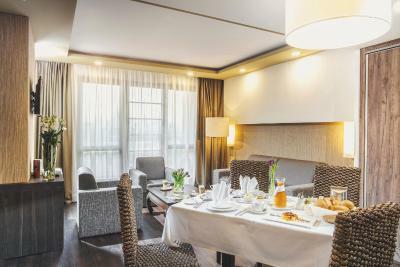 Please note that in case of booking a non-refundable rate, Szép card payment must be mentioned in the Special Requests box at the time of booking. Otherwise Szép card payment cannot be guaranteed. Please note that pets (max. 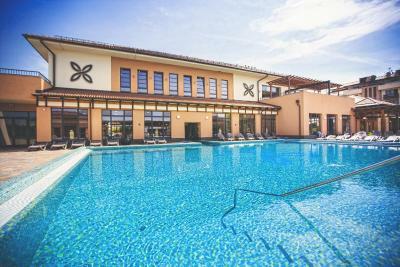 20 kg) can be accommodated only in standard rooms for an additional fee of EUR 26 per day. Please contact the property in advance in case you would like to bring pets. However, I would like to mention that the hotel would need some reparations. The bathroom in our room had a bath and a shower, but my partner had to repair the bathroom doors so they could open since they were stuck. The walls also had signs of mold in the bathroom and the ventilation system did not do its job. We only stayed one night, but we had NO HOT water neither in the shower nor in the bath, which I find inappropriate for a four-star hotel. you have to pay for slippers (5eur/pair) which could be included in the price. Everything really good so far. Just the dinner buffet, is a bit poos. 2 meat dishers one fish, but side dishes dont fit together. And just one starter, Simple tuner pasta salad. .. What i want to say, the quality of the food shall follow the rest of the hotel. Breakfast was very nice! We expected more like spa facility but there is no thermal pool. The hotel does not reach the average quality of the 4 star hotel according to me. Mainly what concerns service. The room cleaning was not good. Some equipment of the room was incomplete or broken. 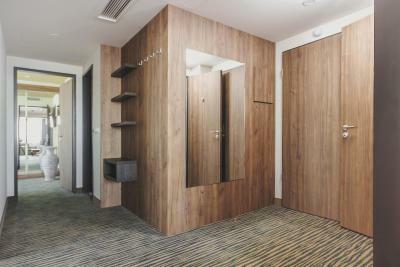 Also at the other spaces of the hotel was visible that the material quality is fine but caring of it is poor. In the area of pools was mold on the ceiling and so on. I personally did not like the stuff attitude on the dinner. When you are not from liked nation, they do not care about. I would also recommend to write clearly what is the dress code for the dinner. If somebody announce me before arrival that I should wear jacket with tie, I would do it. Nothing like this was done and afterwards I was one evening warned with very rude somebody in entrance to the dining room, that my dress is not OK for the dinner and next time I will not be allowed to enter. I had jeans, Tshirt and crocs. Bad? I am not sure - but nowhere written so. 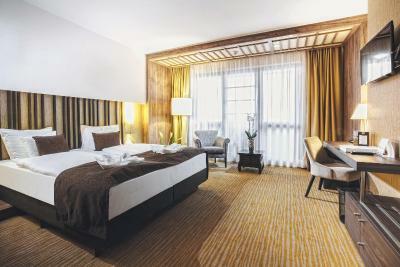 I am travelling a lot during whole year and stay very often in the hotels, so I do think I have some experience to compare. It seems disorganized. Too much waiting for bathrobes Restaurants and bars are disorganized as well. The food was not good enough. You could eat it but I have expected a bit better for a 4 star hotel. Sometimes the waitress had so much to do that it was really hard to find somebody who would take your order. What really made me mad was the towel service. 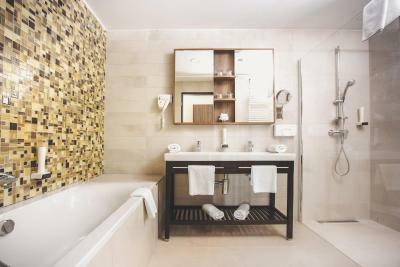 At your room there was just one towel per person to clean everything! No extra towel for your hands, hair nothing! I get it that you shouldn’t waist with towels but I don’t want to do everything in a spa hotel just in one towel! Then they are if you enter the wellness area you get one towel, but you are allowed to change it first after three days! At the sauna were no sauna blankets any more so they told us to use our wellness towels and on the next day refused to give us new ones althought we had to sweat on them in the sauna. The top of everything was, that after checking out we had to carry the dirty towels to the wellness area all the way back and return it there! ( meaning going back to your room, taking it and bringing it there)! The entire towel service was just really disappointing and totally weirdly managed!! Plus it was in the wellness room somehow partly dirty and many things were out of order. I would rate as 3*, standard rooms definitely need renovation, majority of staff don't speak english, there is no sauna ethic (silence, etc.). Since SPA is available also for non-guests, it happened we had no beds for rest in relax zones. 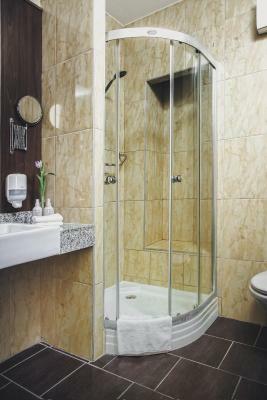 Shower with curtain poor solution for a 4 star hotel, the rooms are old it needs a bit touching up.